Paint it! Make it! Party for Japan! Illustration Rally are extremely excited to announce their very first event! They are getting together with some really great artists and putting on something special for our great community, and you know it's gonna be good when there is live drawing, origami, cakes and zine making, where you can bind and customise your own zine with the work of some of the hottest illustrators around! This illustration by Jane Eccles recently featured on Illustration Rally's Easter Rally. 'Boy with Peach' by Bee Willey. 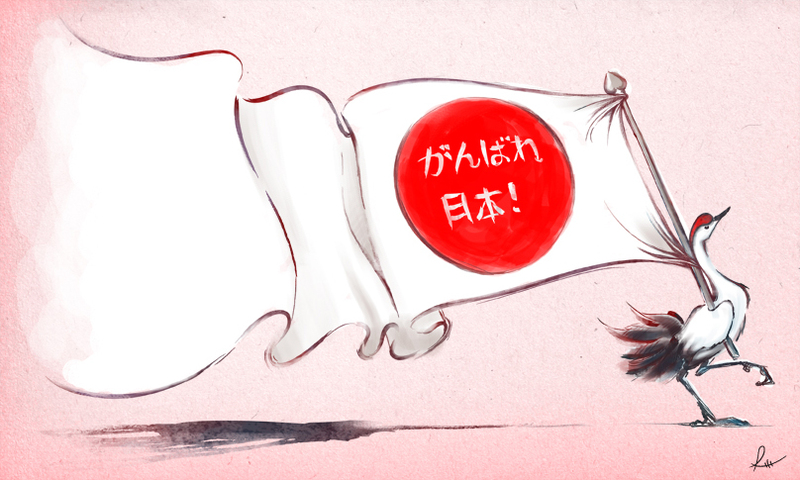 One of two original artworks donated by Bee to Illustration Rally's Ganbare Nippon Etsy Shop - raising money for Japan. As everyone knows, on Friday the 11th March, Japan faced the biggest earthquake in its history followed almost instantly by a devastating tsunami and near environmental tragedy as nuclear reactors failed and started to leak radiation. Firstly for all the people affected by this awful tragedy and to those who have lost their lives, their families and their dearest friends we offer our solemn condolences, and hope that they may find peace and dignity.